The combine utilizes a delayed real-time system so that players all over the globe can respond to things without fear of death because they were not online. As a result of this, movement in the combine tends to take awhile to get from point A to point B. This section will further explain how all the various type of movement works. If you are under arrest, unconscious or dead, then you have no access to cockpits and cannot move. Used by ships with hyperdrive to move from one system to another (or deep space). Ships travelling in hyperspace do not appear on any map or scanners, nor will the scanners of the ship in hyperspace detect anything. Docking into a ship that is in hyperspace is not possible. Aborting hyperspace travel is possible at anytime. However, it is possible that your ship will emerge from hyperspace in a nearby gravitational body. The probability that your ship will be damaged or destroyed. If the ship aborts into a sun or blackhole, the pilot is always killed. If your ship emerges from hyperspace in an empty space square, then you are safe. Hyperspace travel is aborted if the pilot leaves the ship or boards a ship or vehicle within the ship. An astromech droid in the cockpit room of the ship, with relevant piloting skills will allow the ship to continue in hyperspace while the pilot is aboard another ship. After hyperspace has been aborted, there is a 60 minute cooldown before the hyperdrive can be used again. Each level in the relevant piloting skill will reduce the cooldown duration by 5% per level. While in hyperspace, if a ship trajectory crosses a system or space square with an active Interdictor (or any ship with gravity generators turned on), then the ship will be pulled out of hyperspace and its travel will be aborted. Inside a system (sun, planets) or in open space. Can be found: Stations and Ships (wrecks are counted as ships). Ships can move within the system (using sublight drive) and dock onboard any other ship or station providing the docking conditions are met. Docking conditions: A docking bay with enough volume and weight capacity for the target. Plus permission to come onboard (being on the ships/stations crew list or belonging to the same faction or character). Stations cannot dock aboard a ship. Unassigning entities will cause all travel to abort. Travel within the system can be aborted at anytime, it is instant, and you will stop at the square you are currently in. Travel is also aborted if the pilot leaves the ship or boards a ship or vehicle within the ship. When a pilot plots his course to its destination, the ship computer will automatically avoid any suns in the way. However, a pilot can decide to override the computer decision and set the destination right into the sun or right into a Black Hole. If a ship arrives on a sun or Black Hole, its fate will depend upon its class. Fighters and gunboats on a sun or black hole are destroyed, along with whatever they contain. All ships except fighters and gunboats sustain hull damage (30% to 50%), ionic damage (15% to 35%), and shield loss (25% to 60%) and are moved one square to the left, away from the sun (if the sun or blackhole is at X-coordinates 0, then the ship is moved 1 square to the right). The pilot is killed if he is in control of the ship (piloted mode). Various events are logged and available to the ship cockpit (damage), all passengers in the ship (status of who died) and owner (to learn why he lost a ship). 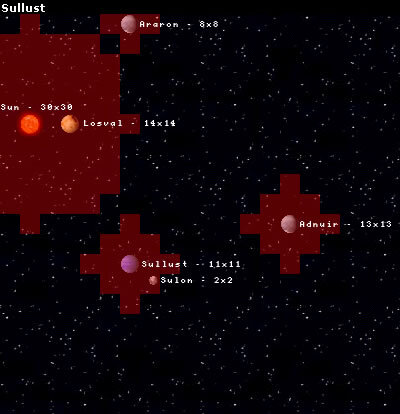 When plotting your sublight course, your ship computer will automatically avoid suns. It is up to the pilot to double-check that the course also avoids Black Holes as there are no automatic checks to avoid them. This can be done by observing the gravity wells in the system. All planetary and celestial bodies (except comets) generate gravity wells that prevent ships from entering hyperspace. The equation determining the size of the gravity well is round(PlanetSize / 6). Only ships that have a hyperdrive, with accompanying navi-comp, can view gravity wells on the system travel map. Let's take a look at an example system, Sullust. The sun of Sullust generates a gravity well of radius 5, this well totally overlaps the gravity well of the planet Losval, which generates it's own gravity well of radius 2. 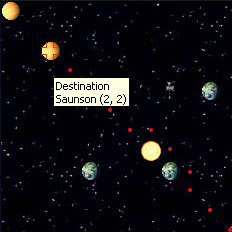 The planet Araron generates a well of range 1. 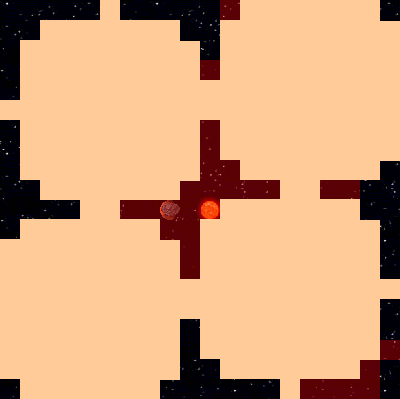 The moon of Sullust, Sulon, generates a gravity well of 0, so it only affects it's own square. Entering hyperspace within a gravity well will result in ship damage. We see here four Interdictor Cruisers present in a system, even here there are still gravity free areas via which ships can escape. Whilst activated gravity well projectors inflict a 25% penalty to sublight speed and manoeuvrability to the ships they are mounted on. Shields on the ship can also not recharge whilst the generators are on due to the amounts of power required by the generators. Any craft with a gravity well generator and projectors will be vastly more expensive, and take far longer to build, than other craft of a similar size and capability due to the complexity of the systems. 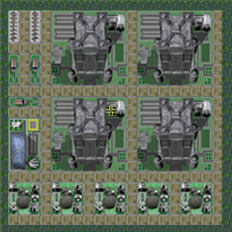 Gravity well generators now take 8 hours to power up. Powering them off is still instantaneous. Entering hyperspace within an interdictor field will result in ship damage. Traveling in a ship from Atmosphere Layer to Space Layer. Only ships can achieve it. Ships will not have access to any scanner info during action, but will be seen on the atmosphere scanner map until completion of travel. Can be initiated from anywhere in the atmosphere (if ship is not moving). The ship will appear on the space square at the planets coordinates. Escape pods cannot ascend from the atmosphere to orbit. Ships and vehicles can move within the atmosphere and dock onboard any other ship or vehicle providing the docking conditions are met. Docking conditions: A docking bay with enough volume and weight capacity for the target. Plus permission to come onboard (being on the ships/facilities crew list or belonging to the same faction or character). Ships and vehicles fitted with repulsors can move within the atmosphere level. Ship/Vehicle Speed: Max speed for ships = 10 *(sublight speed) km/h. Travel within the atmosphere can be aborted at anytime, it is instant, and you will stop at the square you are currently in. Travel is also aborted if the pilot leaves or boards a ship or vehicle within the ship/vehicle. Traveling in a ship or vehicle from Atmosphere Layer to City/Terrain Layer. The ground can be either a terrain square or a city. All ships and vehicles in the atmosphere can achieve it. The pilot of the vessels may select the landing coordinates. Ships and vehicles will not have access to any scanner info during action, but will be seen on the atmosphere scanner map until completion of travel. Traveling in a ship or vehicle from City/Terrain Layer to Atmosphere Layer. All ships and vehicles on the ground can achieve it. The ship/vehicle must not be moving on the ground to ascend. It will appear on the atmosphere map at the coordinates of the city/terrain it was in previously. Ships and vehicles will not have access to any scanner info during action, but will be seen on the terrain/city scanner map until completion of travel. Escape pods cannot ascend from the ground to the atmosphere layer. Can be found: Ships with repulsors, Vehicles and Characters. Ships and vehicles can move within the city/terrain square and dock on-board any other facilities, ships, or vehicles providing the docking conditions are met. Note: facilities have only a condition on volume capacities, not weight. (Weight matters not). Docking conditions: A docking bay with enough volume and weight capacity for the target. Plus permission to come on-board (being on the ships crew list or belonging to the same faction or character). Ship Speed: The maximum speed for vehicles is equal to 10 *(sublight speed) km/h but limited to a maximum 200 km/h. Vehicle Speed: The maximum speed for vehicles is 200 km/h (or less if the vehicle speed is lower). Aborting Ground Movement: Travel on the ground can be aborted at anytime, it is instant, and you will stop at the square you are currently in. Travel is also aborted if the pilot leaves or boards a ship or vehicle within the ship/vehicle. The maximum speed of a squadron or of a party will aways be equal to the speed of its slowest member. All of the above items MUST be used, together, for you to be able to travel on oceanic terrain. When building a city that has an area entirely enclosed by facilities (such as walls), players may make use of the Gate facility to allow transit from the enclosed area to the outer area. Gates may be accessed normally as any other facility, but behave specially when set "Open to All". Gates set "Open to All" will allow ground travel pathing as if the facility did not exist. Essentially, players, NPCs, vehicles, or other entities making use of ground travel that is normally impeded by the existence of a facility will be able to walk over the Gate as if it did not exist. Aborting travel while on top of a Gate will move the entity one step backward in their travel path. Ships, vehicles and characters can travel between city squares using cross terrain. In order to cross terrain, the ship, vehicle or character must be within the border region. 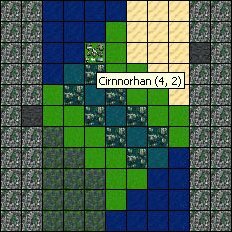 You may only cross terrain to the adjacent terrain tile as you are on the border of. Either you leave your ship/vehicle or board another entity inside your ship/vehicle. If you abort your travel by leaving your entity or boarding another entity, you will not get any XP for your aborted travel. Once inside a ship, vehicle, station or facility, characters are in a room. They may move from 1 room to another instantaneously. Moving out of a facility is also instantaneous. Moving out of a station in space is not possible. The ship/vehicle is on a terrain or city grid, NOT above a facility, not moving. The character will appear at the same square. The ship/vehicle is inside a facility/station/ship/vehicle: the character will appear in a room of the ship/vehicle/station/facility. This can be done at any time. Pilots of entities may kick any passengers off their entity from inside the cockpit for any reason, using the internal kick option. To do so, the entity must be located on the surface of a planet. Anyone with access to an entity that is full may also kick out a random passenger from outside of the ship in order to regain access to it, using the external kick option. This may kick out a creature, NPC, droid, or PC. This feature is intended as an OOC tool to allow players to regain access to their entities that are full, and it may not be used for IC purposes. This means that loading an entity until it is full and kicking off passengers until a character on board is forced into a position where they can be arrested is not an acceptable use of the feature. Kicking a passenger out of a single-room entity into a position where they can be arrested is also unacceptable. However, using the external kick feature in order to free up room on an entity in order to board it and arrest a passenger is acceptable. The Ship or Space Station has been reduced to 50% of either its Ionic or Hull statistic. Additionally, you must be in either the cockpit or entrance room in order to launch an escape pod. Escape Pods can be re-added to the ship or space station through the use of the repair feature.